Have you ever watched Robert Downey Jr. strap himself into his shining metal exoskeleton, electric guitar throbbing in the background, and thought, “Yeah, I’d quite like to do that”? 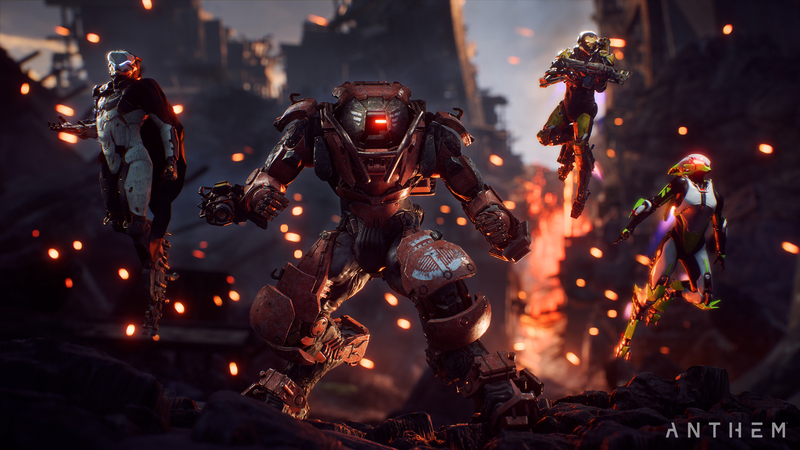 Then look no further than Anthem – BioWare’s mech game that sees you suit up and savour the majesty of flight in a sumptuous sci-fi world, where you uncover the secrets behind a mysterious power, the Anthem of Creation. And no, the anthem in question is not Bohemian Rhapsody. I checked. 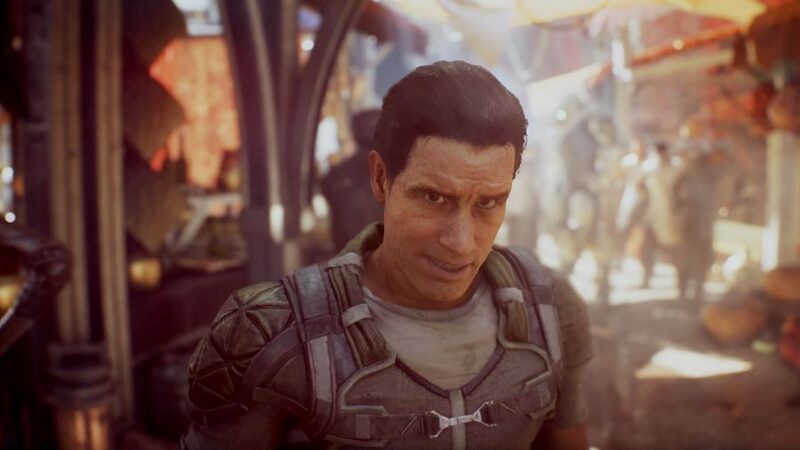 Unfortunately for fans of Dragon Age and Mass Effect, Anthem is not the kind of single-player, story-driven experience you might have been expecting from the Canadian studio. 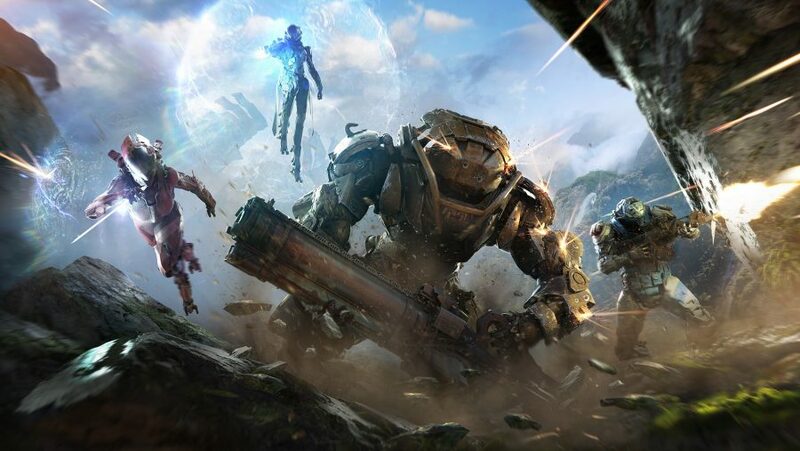 While BioWare’s DNA can be detected in Anthem’s intriguing narrative, this is a multiplayer game like Destiny 2 and The Division which is best played with friends. After I spent a few hours with the game, and found in my Anthem impressions that its outstanding flying mechanics will keep you busy for hours on end as you perfect your pilotry. 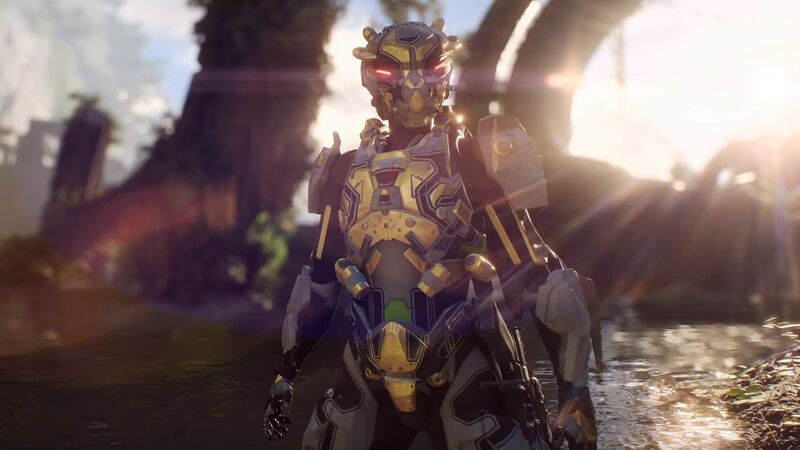 Shortly afterwards I spoke to gameplay producer Zachary Beaudoin, to get a behind-the-scenes glimpse at the making of Anthem’s flight mechanics – and how this astonishingly large world came to be. PCGN: What key sci-fi inspirations did you have for Anthem? Zachary Beaudion: It’s hard to say because Anthem was in development for a long time. We spent a lot of time in ideation, creating this universe, and so it’d be difficult to pin it down to anything too specific. Aren’t there cabinets filled with sci-fi books in the studio? Yeah, and not just science fiction. Anthem is more of a science fantasy game. We have both a science fiction franchise, Mass Effect, and a fantasy franchise, Dragon Age, so there’s just this great wealth of knowledge and experience and ideas in those two areas, which come together and form something that’s very neat. Which is Anthem. How is maintaining a sense of mystery in the story reconciled with a game that’s designed to be replayed? It really comes down to the nature of the world itself. We have an enormous possibility space when it comes to storytelling, given the fact that there’s this ongoing conflict that is the Anthem, the technology, and the factions that are trying to leverage its power for one reason or another. That creates a lot of great storytelling. Is this a world that wasn’t technically possible to build before? Technology-wise, it’s hard to say. It’s not like there’s a recent technological innovation that made it suddenly possible to build. It really came down to having a clear vision for the world and what that universe was going to be, which is what we spent a lot of time crafting before we started actually building the world for real in production. We had to go through that journey first and that’s what allowed us to then go, “Okay, what’s the best way to go about solving that?”. Like any other technical challenge you get in development. It must have been tricky to make such a large world consistently interesting. We have a lot of experience building worlds and building games. What really actually made for a challenge this time around was the introduction of flight as a traversal mechanic. Because a lot of games, and ours included, they’re mostly really just like a 2D plane. There are some ledges and height differences, but you’re always looking at the world like a human on their feet. When we introduced flight, we realised that kind of world wasn’t so interesting anymore. We had to figure out how to build worlds that have a lot of verticality in them, and really take advantage of that not only for traversing, but combat as well. That was where really interesting challenges came up, and it was a real innovation in the way that we create worlds. Is there a difference in creating the kind of choice-based gameplay for which BioWare is known in a different genre? Yeah, it was interesting – because that kind of personal storytelling, having choices that are meaningful and impactful, that’s part of our core DNA as a studio. 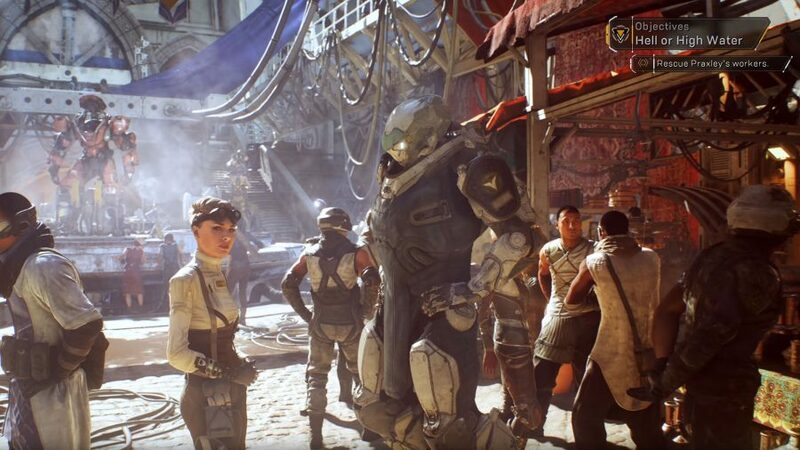 One of the challenges that we had to solve for Anthem was how you could be the hero of the story in a multiplayer social game. Anthem was a social experience from day one. You have the choice of four mech suits, known as Javelins, during your time in Anthem. You’ll unlock a new one gradually as you level up, and you’ll start with the all-rounder class, Ranger. You’ll then get to choose from the burly, tank Colossus, nimble Interceptor, and the mage-like Storm. Here’s where you can find out more about each Javelin and their different abilities. We had to crack that, and one of the things that we realised through a lot of experimentation, design, and animation was that we had to separate the social experience. That’s why we have Fort Tarsis as a place where your story lives, and the characters that you meet and your choices are reflected in that world. That’s a very personal space. But online, everyone has the same game state, the same server – if there’s a storm, everybody has the storm. Whatever’s going on in the world is a shared experience with all the other Freelancers. That was the way we figured out how to keep the best of both worlds. How do you see players splitting their time between the Fort and the world outside? Do you expect people to be spending a lot of time in the hub, or it is more a place where you go and spend your upgrade points? It really depends on what you want to do with your time in that day. You might sit down and say, “Hey, I really want to invest in the characters and stories, so I’ll spend some time in Fort Tarsis today’. Then you see your friends are popping online and decide to go for a [high level, cooperative] Stronghold and spent a lot of time doing that. It will come down to what you feel like doing. Which of BioWare’s key strengths have been important in the creation of Anthem? A great worldview, and really interesting, rich characters that you develop relationships with. Really good core storytelling, and your own epic adventure where you get to be the hero. But we didn’t do romances this this time around because we didn’t want relationships to be entirely with these NPCs so much. We wanted to include other players. Would you say the best-written characters in Anthem are your friends? Well in my life they are *laughs*. They are the richest characters I know. The premium currency is focused largely on cosmetic items. So does that rule out paid-for Javelins then? How does that work? At launch, all monetisation will be around cosmetics only. None of the content that we release, whether experiential, the story, or power, is paid for [beyond the box price]. It’s all free. We don’t want to split the community between people who paid for access to things and people who haven’t. When it comes to the design of the Javelins themselves, from the cosmetic side it’s clear you recognise that’s an important way for people to express themselves. Well the gameplay is where we took great care. With every exo we said, “We don’t want these to just be a variation of colour and aesthetic, we want them to look, feel, and play very differently from each other. Then within that, with the gear choices you have available, there are different kinds of builds you can make. You get more variations the more experience you get with that exo, and we think that will be very compelling from a gameplay standpoint. On the customisation side, what we really wanted is for people to really feel like they can differentiate themselves, really personalising that exo and making it a representation of themselves. That was a big part of driving this vast array of personalisation options that we’ve put in the game for launch. One of the stand-out parts of the game is flight, and there’s a lot to it in terms of the heat meter and how you manage that. It seems like something that must have taken a lot of time. Oh yeah. Flight isn’t something that was there from day one, it was something we discovered almost by accident. When we put it in, it was just so amazing and we saw this enormous potential of just how greatly it could enhance our traversal and combat. We spent a long time just iterating on flight. We really wanted to give you a sense of mastery. You’ve got the heat build up, but if you skim a water surface that cools your jets. It’s about learning new things, and when you get more experience in-game then you start to learn the terrain – if there’s a waterfall that goes into a stream, you can get further than your heat level [would normally allow]. So it takes expert players to get around the world in amazing ways. Is there any bit of gameplay that stood out to you from a member of the team in testing? Well in our QA team, some testers could win battles without touching the ground, in ways we didn’t expect. And suddenly we were like, “Well that’s really cool, but our creatures weren’t built to handle that”. So we had to go back and make changes to the creatures so that they could engage the player better in the air. So actually the design of the enemies adapted to how people fought them. That’s really interesting. There were moments where I thought I was just getting the hang of it. And then I would go down in an overheated ball of flame; it feels like something that you’ve got to learn. You’re absolutely right. We wanted to make sure that there were vectors of mastery in flight. It’s easy to do, you pick up the control and it feels really natural, but you’re gonna see players that have figured out tricks that you didn’t. Then you learn from that, and you practise, and you feel that sense of mastery. That’s something we wanted. When players get to the endgame, that mastery is going to be really important, but it seems critical to have friends with you too. How far do you see solo players getting in the hardest levels? It’s not like endgame is entirely multiplayer or not. So we have Strongholds that are designed for four players. We’ll let you in as a solo player, but it’s going to be really hard. If you gear yourself right, and you’re doing the Legendary contracts, it can be done. It’s just meant for four players. It’s going to be hard. Do you think that might put off solo players? We have other other activities that you can do. Stronghold is the only thing we have so far that is designed exclusively for four players. But we have Legendary contracts, there are challenges, and there are going to be other things. Those activities can be done in groups of varying sizes down to one player if you want.